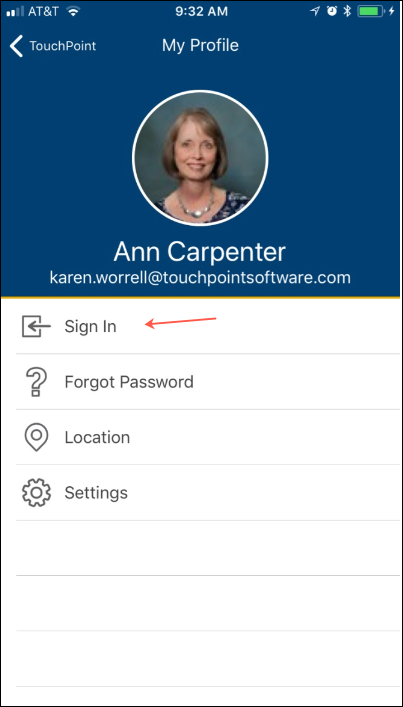 If you are a lay leader for your church you can take attendance for the classes you lead using the TouchPoint Mobile App. A staff member can follow these same instructions list below. The difference is that a staff member will not have the role OrgLeadersOnly. However, he does need to follow the other requirements. These instructions apply to the latest version of the app which is just now being set up for clients as of Nov. 2017. See the help article below if you are using the current mobile app. The staff member with Admin role must give you a user account with the following roles: Access, Attendance, and OrgLeadersOnly. 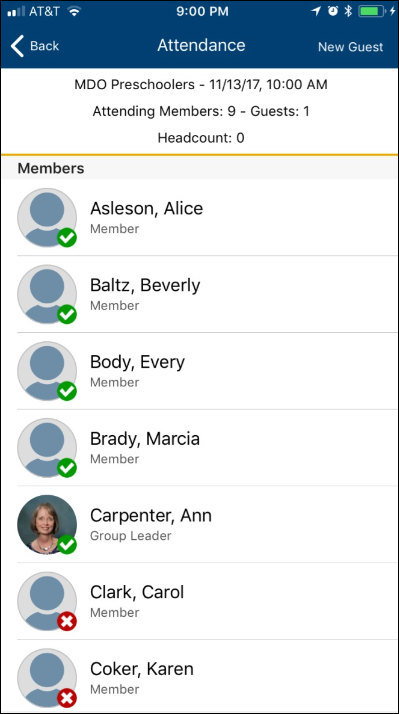 A staff member taking attendance using the app should not have OrgLeadersOnly role. You must be enrolled as a Leader in the organization for which you plan to take attendance. If you plan to take attendance for multiple orgs in which you are not enrolled, you can be enrolled as a Leader in a Parent Org and you will be able to take attendance for any Child Org associated with that Parent Org. Download the TouchPoint Mobile App from the Apple Store or Google Play. 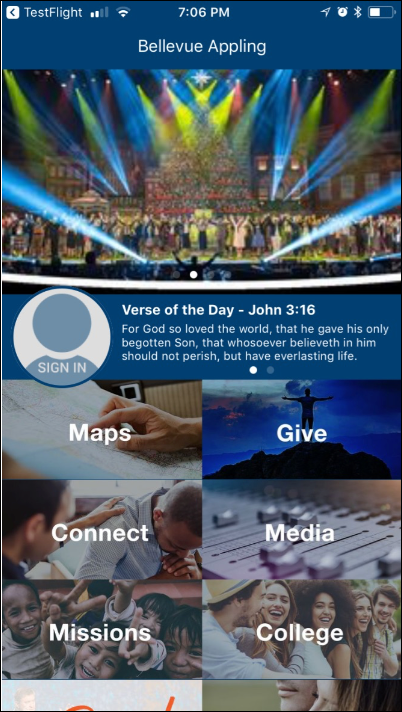 If your church is using a branded version of the app, you will find the app listed using your church’s name. If you are using the free version, you will download the app named TouchPoint Mobile. Your church staff will let you know which version your church is using. The first time you log on you will be asked to provide the name of your server. This will be the same as in the URL when you access TouchPoint on your computer. The first part (https://) and the last part (.tpsdb.com) will already be there. You just supply the actual church name as it appears in your TouchPoint URL. See image below. 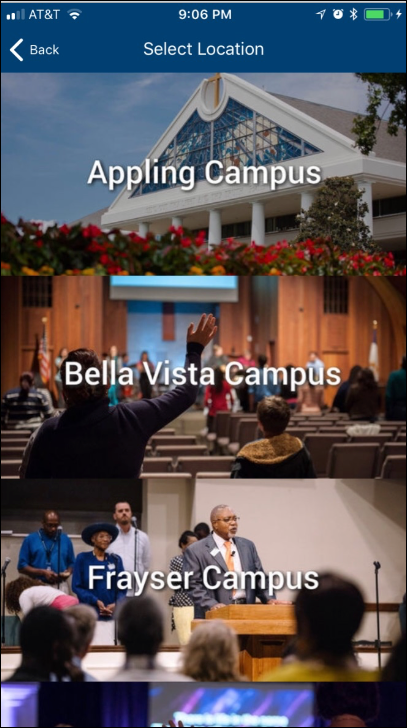 If your church has multiple campuses, the first time you access the app you will Select a Location by pressing on the campus you attend, and then click Set app to this location. This is the campus whose events you want to view on the app. See image below. Next, click the person icon in the middle of the screen where you see Sign In and then select Sign In on the next screen. See image below. See Options image below. If you do not remember your password, you have the option to select Forgot Password. 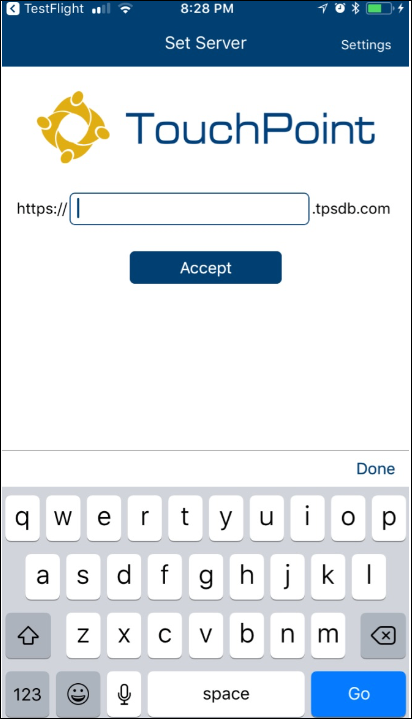 Then you can enter your username or the email address on your record in the database and press Request Password. You will receive an email with a link allowing you to reset your password. Then you can return to the app and log in. Enter your username (or email address) and your password. These are the same as when you access TouchPoint on your computer. You will then have the option to set a 4-digit PIN number and use TouchId (on the iPhone). The next time you log in you will just use either the TouchID or your PIN#. Once you have logged on, you will be viewing the My Profile screen for your record. Select Tools > Attendance. Next, select the Org/Meeting for which you want to record attendance. You will see only those orgs in which you are a leader. If you have orgs with multiple schedules, you will see an option for each meeting. The Members will display first, sorted alphabetically, followed by any Guests. Press the name of each person present. The attendance will tally at the top of the screen split by Members and Guests. If you need to enter a Headcount, press in the top section of the screen. Then enter the headcount total. You can record attendance for those you know are present, and then enter the total number present if you know there are more people in attendance than you can account for. See image below. If you want to Drop an existing Member, press and hold and select Drop. For anyone in the attendance roster list, you can press and hold and select View Details to view more about that person - address, phone numbers, family members. When finished recording attendance press Back at the top left of the screen to return to the Attendance list of orgs. Press Back again to return to your My Profile screen. You can return to the same meeting if someone comes in late. Just click the Org/Meeting and follow the same procedure as above…depending on whether the person is a Member or a Guest. To add a new guest press New Guest at the top of the screen when viewing the list of Members. Search for the person as you would on the normal application using part of a first name, a space, and part of the last name. If the person you are looking for is in the results list, select his name and he will be added as a New Guest to that meeting and his name will display after the list of Members. If you want to make any Guest a Member, while still viewing the roster list, press and hold the Guest’s name and select Join. When searching for a New Guest, if you do not find the person the first time you search, you have the option to Search Again, or perform a Family Search. We always recommend that you search again, perhaps using a nickname or using less of the name in the search. The person might be in the database under a slightly different name or with an incorrect spelling. The best way to avoid creating duplicate records is to search effectively. If you still do not find the person, perform a Family Search. You can search by only a last name and phone or email or address. This is to see if there is anyone in his immediate family in the database. If you find a family member, when you select him, you will be creating a new record for your New Guest. However, he will be added to the family of the person you selected. Enter the required information and press the blue Add Person at the bottom of the screen. If you do not find a family member, you can either Search Again (this will allow you to repeat the family search) or you can Add New Person. If you add a new person, complete the information requested and press the blue Add Person button at the bottom of the screen. Each New Guest will be added to the roster list under the names of the Members and will be marked present.